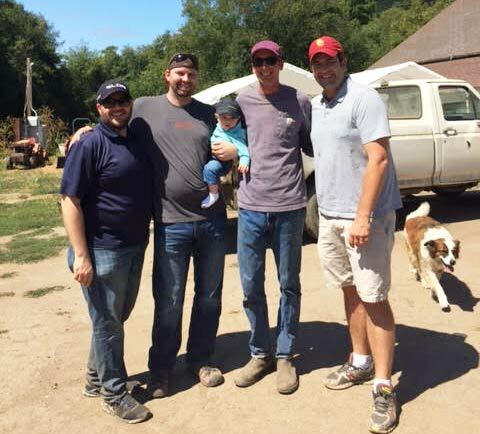 David Hunsaker (right), owner of 31st Union, and part of his team visited Blue House Farm with the farm’s owner and operator Ryan Casey (second from the right). Photo provided by 31st Union. As a staff member of POST, there are many times when I am lucky enough to witness how all of our efforts come full circle. Last night was one of those special moments. 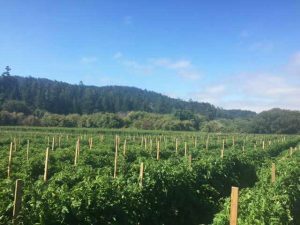 31st Union in San Mateo held a farm-to-table dinner for 80 guests in support of POST’s Farmland Futures Initiative. The dinner featured produce from POST-protected Blue House Farm. It was especially meaningful to me that David Hunsaker, owner of 31st Union, and Ryan Casey, founder of Blue House Farm, met at POST’s Taste of the Coast event in late April. We had asked David to participate as a chef/restaurateur and paired him with Ryan at Blue House Farm to collaborate on small bites for the event. They struck up a friendship and this partnership continued as David learned more about POST’s work protecting farms and supporting farmers like Ryan who are producing local organic food. David was eager to contribute to this effort through his restaurant’s annual benefit dinner. And, the connection goes on beyond that, as the entire 31st Union team went out to visit the farm last week. You should have seen the excitement on the face of our waiter as he told me about going out to pick berries and produce! He was so proud of the meal he was serving to us. Blue House Farm grows certified organic produce and flowers on POST-protected land near Pescadero, CA. Photo provided by 31st Union. Our five-course dinner was beautifully presented and incredibly delicious. But what made the meal so unique was the unbeatable fresh produce and the opportunity for guests to meet and talk with Ryan. Ryan shared his story of growing his farming operation and describing the melons, green beans and berries that would be served at dinner. How often do you get to meet the person who grew the food that is on your plate? I thought to myself, “This is the way it is supposed to work.” For me, it was a reminder that it’s the connections we create that make a lasting impact in our communities. This new relationship is an example of that; everything came together in the right way.